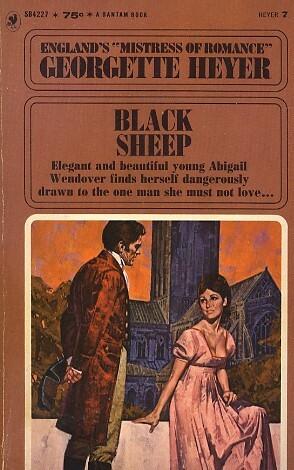 With her high-spirited intelligence and good looks, Abigail Wendover was a most sought-after young woman. But of all her high-placed suitors, there was none Abigail could love. Abigail was kept busy when her pretty and naive niece Fanny falls head over heels in love with Stacy Calverleigh, a good-looking town-beau of shocking reputation and an acknowledged seductor. She was determined to prevent her high-spirited niece, from being gulled into a clandestine marriage with hansome Stacy, a plausible fortune-hunter. The arrival to Bath of Stacy's uncle seemed to indicate an ally, but Miles Calverleigh is the black sheep of the family. Miles Calverleigh had no regard for the polite conventions of Regency society. His cynicism, his morals, his manners appalled Abigail. But he turns out to be Abbie's most important ally in keeping her niece out of trouble. He also turned out to be the most provoking creature Abigail had ever met - with a disconcerting ability to throw her into giggles at quite the wrong moment. Yet she was irresistibly drawn to his knowing smile. But how could she persuade her wealthy, respectable family to accept this unconventional, unsuitable man?